Prominent Ukrainian businessman Ihor Kolomoisky has denied allegations that he is providing financial support to Ukrainian presidential candidates Volodymyr Zelensky and Batkivschyna Party leader Yulia Tymoshenko. "There are contractual relations with Zelensky: between the television channel in which I am a stakeholder and his production studio. I believe the 1+1 television group is really interested in a contract with Zelensky's Kvartal, for which he is the front man. This is all about our relations. We have no common business," Kolomoisky said in an interview with BBC News Ukraine posted on Friday. "A man with a lower IQ and erudition cannot influence a more intelligent and talented one. Therefore, I can say that he is independent enough, even absolutely independent," Kolomoisky said. A lack of political experience is not a problem for Zelensky, Kolomoisky said. "A change of generations is always a painful process. It always seems: how can we allow younger ones to take the steering wheel, they have no experience and can't do anything, and it makes sense to leave experienced politicians. But this gives no result," he said. Kolomoisky also denied providing financial support to either Zelensky or Tymoshenko. "You can rule out financial support outright. Even if I wanted to support [them] financially, I couldn't, because I am restricted with the assets having been frozen by the High Court of Justice in London," he said when asked whether he has given financial support to the two candidates. Asked whether Tymoshenko could be a good president, Kolomoisky said, "I believe that, even though she doesn't belong to the young generation of politicians, this is a person who's gone through fire and water and seen rises and falls [...] She would definitely be better, but we should make way for the young," he said. As regards incumbent President Petro Poroshenko, Kolomoisky said, "I don't want him to get another term. I believe the first term has been five years of frustration because of his rule." 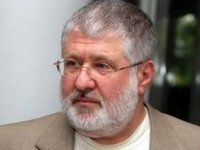 Kolomoisky, who is currently staying abroad because of problems with the incumbent authorities, said he might come to Ukraine soon. "I am thinking of coming to Ukraine before the first round [of the election] or between the first and the second, so as to make our distinguished Petro Oleksiyovych [Poroshenko] happy," he said.